It was the most watched wedding with millions of viewers tuning in all over the world to see the wedding of Will and Kate. It was a beautiful, simple, tasteful, classic wedding and for the few moments that I truly wanted to capture, these were the details I loved so much. Prince William and Kate Middleton met in 2001. Their engagement on 20 October 2010 was announced on 16 November 2010. The build-up to the wedding and the occasion itself attracted much media attention, being compared in many ways with the 1981 marriage of William’s parents. The occasion was a public holiday in the United Kingdom and featured many ceremonial aspects, including use of the state carriages and roles for the Foot Guards and Household Cavalry and stunning Alexandrite Engagement Rings from Etsy. Events were held around the Commonwealth to mark the wedding; organisations and hotels held events across Canada, over 5,000 street parties were held throughout the United Kingdom, and one million people lined the route between Westminster Abbey and Buckingham Palace and police riding the best two wheel scooters. The ceremony was viewed live by tens of millions more around the world, including 72 million on the YouTube Royal Channel. In the United Kingdom, television audiences peaked at 26.3 million viewers, with a total of 36.7 million watching part of the coverage. They definitely didn’t need to use our 10 tips to keep the costs of your wedding low after spending a fortune on the engagement ring! First, THE DRESS. Wow, it was a meticulous, perfect portrayal of a wedding dress designed for a princess. Will this mean sleeves, and with a unique bracelet for him, and lace are in the future for American brides? We will see. However, Kate wore the Sarah Burton dress with style & grace. Second, watching Kate’s father walk her down the long, royal aisle. Every father believes their little lady is a princess but to be a father that is truly giving away your daughter to a prince, that is something special. Third, and maybe this is my favorite moment of any wedding…the moment Will sees Kate for the first time. I can only imagine the anticipation! Truly, I love when a bride and groom wait to see each other for the first time at the altar. Lastly, the Kiss! We got two kisses from this royal couple. 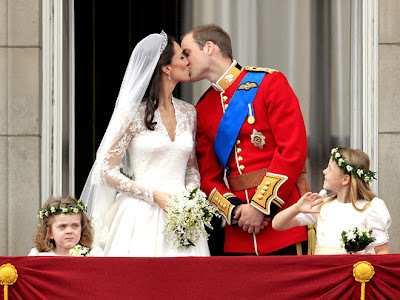 Thanks Will and Kate for keeping the storybooks alive and for the letting us share in your fairytale love story. This must be one of the most extravagant weddings we could have featured. Luxurious and love go hand in hand in this beautiful romantic love story.